I'm closing in on a functional trip timer. I've got the hardware and software more or less figured out. 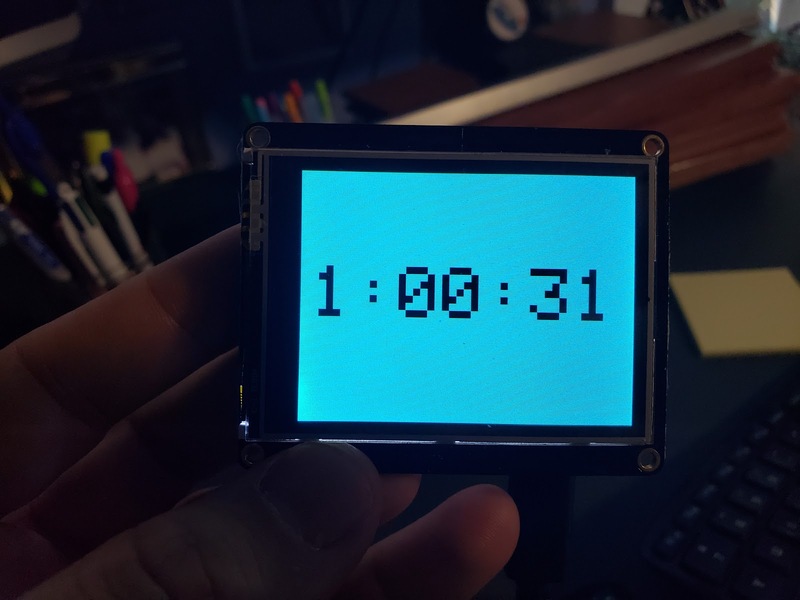 All that was left to do was write the code to implement a stopwatch like display. 1. Having the code from my micro:bit prototype was a big help. I'd already figured out a number of math and formatting challenges, and was able to reuse this code. 2. I used this sample as the basis for my code. It told me that I needed the GFX, ILI9341 and SMPE610 libraries, and how to initialize them to properly drive my 2.4 TFT FeatherWing screen. I was eager to avoid the type of confusion I ran into when I mixed up the ESP8266 with the ESP32. 3. You can see I'm deriving the background and text color from the current value of minutes. This is my attempt to make the timer gracefully fade from one color to another throughout an hour. It works, though the color choices need to be smarter. 4. The timer seemed to work great, but when I'd come back after a few hours it had reset itself. The problem was that I was relying on a call to micros() which rolls over every 70 minutes. I switched to calling millis which resets every 50 days. Up next, I need to take this guy for a road test and see how it does in the car. Then I need to build an enclosure to keep my new baby safe. And then I believe I'll be able to call this complete!